The ancient yogis intuited that we all have subtle energy paths + centers all throughout our bodies. These centers are spinning wheels of energy called Chakras. Different spiritual paths describe different numbers of chakras and have assigned them different colors and attributes. The concept of the Chakras can seem really abstract and as with all subtle energy, not always readily accessible. In other words, you might not be able to feel into your own chakras and understandably, be a little bit skeptical about their existence. And I totally get that. It’s one thing to read in a yogic text explaining that the body is made up of entities of subtle energy and when these major vortices of energy align, boom, you reach enlightenment. It’s a whole other thing to experience the energy of these different centers for yourself. Can you really feel them in your body and have momentary (or sometimes sustained) glimpses of awakened connection with yourself and everything around you? And if you can feel them, what do they feel like? I like to think of the chakras as tiny gateways into the remembrance of that awakened state. They offer us themes to work with and help us understand our experiences, traits, idiosyncrasies, and issues a little bit better. By working within the qualities and attributes of each chakra (qualities that might feel more tangible than subtle energy,) we can come to know ourselves a little bit better. It’s hard to talk about the Chakras without also talking about the energy of Kundalini. As I understand it, kundalini is a specific form of Shakti (divine feminine energy), it’s sometimes even referred to as kundalini-shakti. This specific form of energy is said to be coiled at the base of the spine (the root of the word Kundal, actually means “coil”) and it arises up through each of the energy centers all the way to the Crown chakra where it unites with Shiva, consciousness. This unification of Kundalini-Shakti (divine creative energy) with Shiva (consciousness) enables a full awakened and creative state for the individual. This is called a Kundalini awakening. But what does this mean for regular ole yogis like you and me? I believe that even though most of us aren't walking around in states of enlightenment, we are all having tiny awakenings happening within us all the time; little moments of oneness, peace, stillness, and expansive creativity. I also believe that within the small awakenings we experience in our every day lives, there is something profound happening to our creativity. When the creative energy flows through a chakra and we engage with the qualities of that center, we are awakening new pathways to experience and work with the different aspects of the creative process. In my experience, blocked creativity looks a lot like blocked chakras. And when the chakras are awake, alive, energized and vital, and flushed with that crazy creative, powerful Kundalini-shakti, it results in flowing, inspired creativity. Open chakras work in tandem to help you unfold your creative potential. Get out into nature with some time and the intention to connect with the earth. If it’s warm enough, go barefoot! Find a place on even ground where you are feeling called to create your mandala. 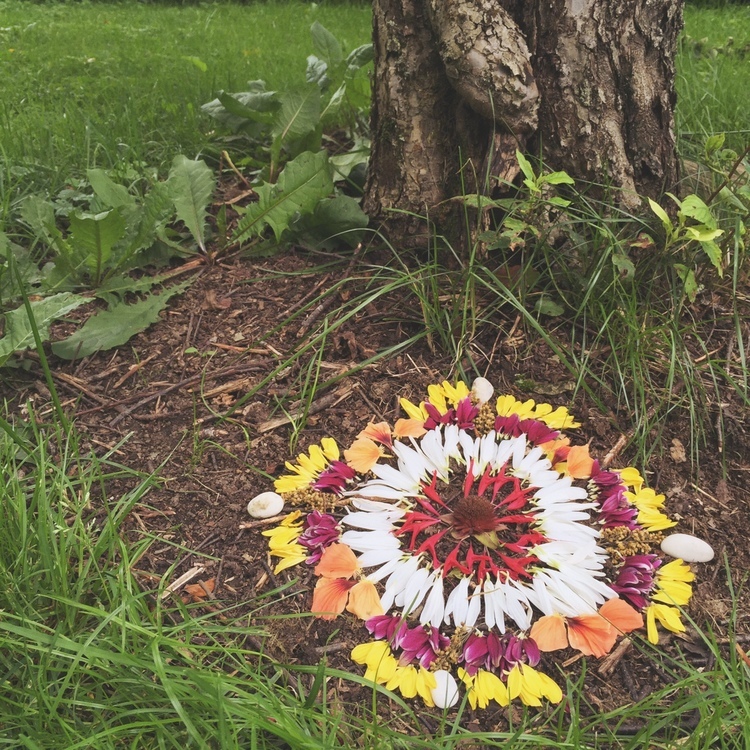 Collecting sticks, or stones or any other element of nature that you find, begin to create a circle, a mandala that represents your sense of belonging on the earth. Spend as much time as you need, breathing deeply while you work. When you have finished your mandala, spend a few minutes in quiet meditation with your eyes closed or gazing down into your creation. Turn up the tunes, dance in your living room. Put on your favorite song. Dancing is so good for bringing in more fluidity to the body and waking up sacral chakra! Become an explorer in your own backyard. Look for patterns, textures, symbols, colors, anything unique and interesting that catches your eye and document them in your sketchbook. Looking at ordinary things in a new way can help break your inertia and rev up the solar plexus chakra. Get out some watercolor paper and paint. Wet down the watercolor paper. Put some paint on your brush and take a deep inhale. Exhale and let the paint move through the water and over the surface of the page. Continue this process until you have filled the page. The Heart Chakra is connected with the breath and the energy that is carried into the breath, so tuning into your breath helps to open the heart chakra. If you are self conscious about your voice, find a time when no one is around. Belt out your favorite song or make up one of your own, maybe about how you are feeling in that moment. Sing at the top of your lungs and in a soft whisper and even if you feel silly. Notice if you feel any differently after. Singing wakes up the vocal chords, eases tension in the jaw and mouth, opens up the lungs and makes the Throat Chakra ring! The making of the yantra is a meditation in itself and then can be used as tool to meditate upon. Collage Vision board for what you want to manifest in your life. Cut out bits and pieces from these pages and glue them to your board. These don’t have to be pictures of things, they can be textures, colors, patterns that represent what you desire and how you want to feel in your life.